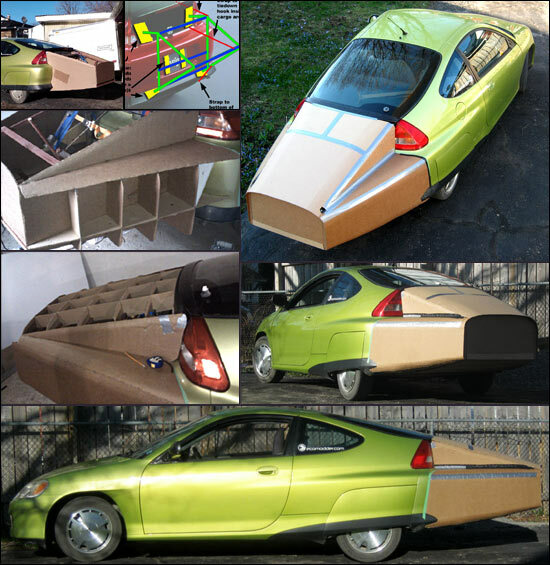 This discussion thread documents the construction & testing of a temporary, proof-of-concept aerodynamic "boat tail" on a 1998 Pontiac Firefly (Geo Metro). Hard to park? No. The car + tail is only ~30 cm (12 inches) longer than a 2008 Toyota Camry (the most popular car in the U.S.), and shorter than a Ford F-150 (most popular truck). So it would easily fit in a normal parking spot. Sturdy? Yes. I could shake the entire car up & down and side to side from the end of the tail. Ugly? Duh! It's a prototype made of cardboard and duct tape! But the idea is beautiful in my eyes. 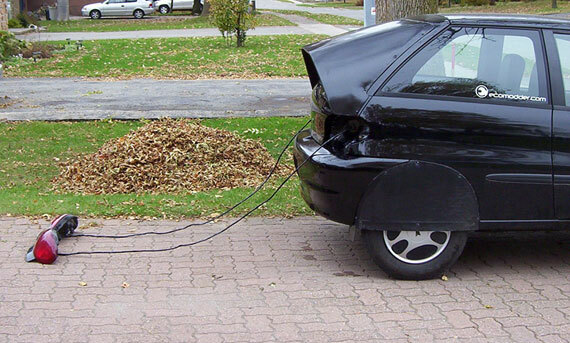 Most production vehicles are aerodynamic disasters on wheels, and I think that's ugly. 2) Tuft testing: the tail spent a lot of time in the poor man's wind tunnel (ie. being tuft tested). This means observing the motion of yarn tufts taped to the car. The tufts reveal the direction & nature of air flow, and indicate whether the design works or not. Tuft testing results can be seen in the YouTube video, below. I'm imagining 6 separate panels that will somehow snap or wingnut on to a light frame that can be easily dis/assembled. I've done lots of waffling on materials, but I think I'm going to go with aluminum for the frame and coroplast for the skin. Both for their lightness, and ease of workability. Assuming I can find black coroplast (Home Depot here only has white - $20 per 4x8 - and the sign making shop wanted an obscene amount for a 4x8 black sheet of it). Runner up idea was a fabric skin - UV resistant boat top canvas (which I can get in black). But thinking about hurricane force wind that will rarely be coming from directly ahead of the vehicle made me think coroplast is probably better. 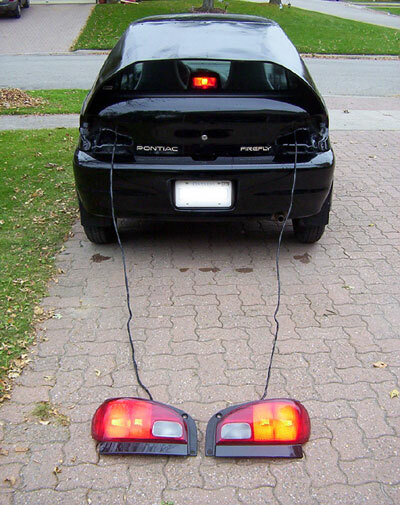 One task I've actually completed so far: I added 6 feet to the wiring harness of each of my tail lights so I can move them between the back of the boat tail and their stock position as needed. 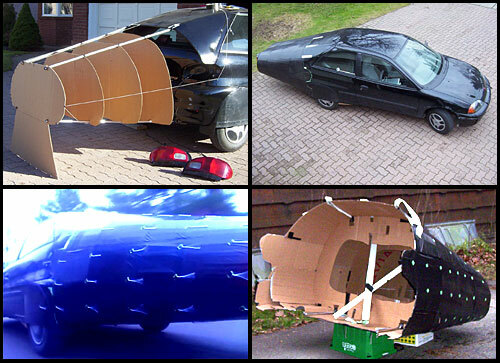 Twice now I've pulled the car into the garage and fussed around with various building materails, from cardboard to styrofoam to wood to alumimum. Nothing built yet. I've spent a silly amount of time standing around looking at the back of the car. I think I need to just start building! I vote for boat canvas. If fabric is good enough for biplanes why not a car? You could use brass grommets to hook onto pins. Also works for lacing, cinch up points, or tie-down points. It keeps it flexible to fold up when not in use. Interesting project. I'm following closely. I need to do something for my aero some day. Have you considered the Fiber Reinforced Plastic sheets at Home Depot, (the bubble texture shower wall stuff) It can take high heat, can be formed and is quite strong. Easy to cut and very thin. $27 for a 4x8 sheet. Oh! This is gonna be interesting to watch! You might wanna check Rona too. Here 4x8 coroplast sheets are 16 and change at Rona. Get a tent and mod it to glom on the back (or get similar materials and use similar construction). Light, easy to break down, waterproof, cheap. Has those strong yet light and flexy fiberglass poles. I was thinking of a collapsible aluminum frame (all one piece, but can be folded in on itself/collapsed into itself, like when you lower crutches) with the boat canvas stretched over some chicken wire. The chicken wire will add enough stiffness that the canvas shouldn't deflect that much, and the whole thing can be removed/collapsed on itself, taking minimal space in the interior. If built intelligently, a piece of the removed canvas could also double as a windshield sun-shield, as well as a couple pieces for the front windows. That would take some real engineering time, though. You may not need aluminum framing except as stiffeners. A bent coroplast corner is quite stiff. Modern plywood boats are often frameless, and better for it. Cool, I'd like to see what you come up with. I used metal skin on mine because it was free, and because welding it to the frame made it rigid with not as much work. Didn't get a pic of mine with the extended tailpiece before I took it off, but I've gotten my downstate mileage back after removing it. I would go for the Styrofoam!! The stuff is easy to cut/glue/form/sand/paint and so on. Go for panels that are 1.5 inch thick. I think cost is around $15 per sheet. After the shape is complete, add one layer of 6 ounce fiberglass cloth and epoxy to the foam, using the wet layup method. Make sure to add about 3 layers on all your hard-mount points, and embed wood blocks in the foam in these areas. For a boat tail, you will probably go through about one gallon of resin, and if you use West Systems, it will set you back about $100/gallon. Cloth, about $40 or so. The cool thing about foam is, after your done, it will look just like an automotive finish. Of course don't ask about how much time the sanding/glazing/priming and painting will take. But this is something you can do anytime you wish. Just take them off the car and start sanding. And you can still drive the car in between. I've been pondering this as well. Not a priority at the moment with two other projects on the burners, but maybe something worth it for either of us to cobble something together as a mock-up for the AMEC run. Don't forget the use of strong magnets and/or suction cups! I really feel like neodymium magnets or strong suction cups could be at least two of the supports for a removable boat tail. You may not need aluminum framing except as stiffeners. A bent coroplast corner is quite stiff. Except there should be no corners on this boat tail. All the "sides" of the boat tail will be rounded (think: more of a cone than a pryamid, so will need some kind of framework to support the shape. Correction: there will be hard edges where the boat tail terminates at the "transom". Christ: the chicken wire idea to support fabric is a good one. But I decided against fabric because chicken wire or the supporting "tent pole" framework to get the polygonal "resolution" I want will be as bulky for storage or as much work as doing coroplast surfaces, I think. Anyway, here's all I have to show so far. Should have enough length here to go almost to a point if I want to take it that far. (But I don't plan a point - it'll have a flat rear surface to mount the lights/licence plate.